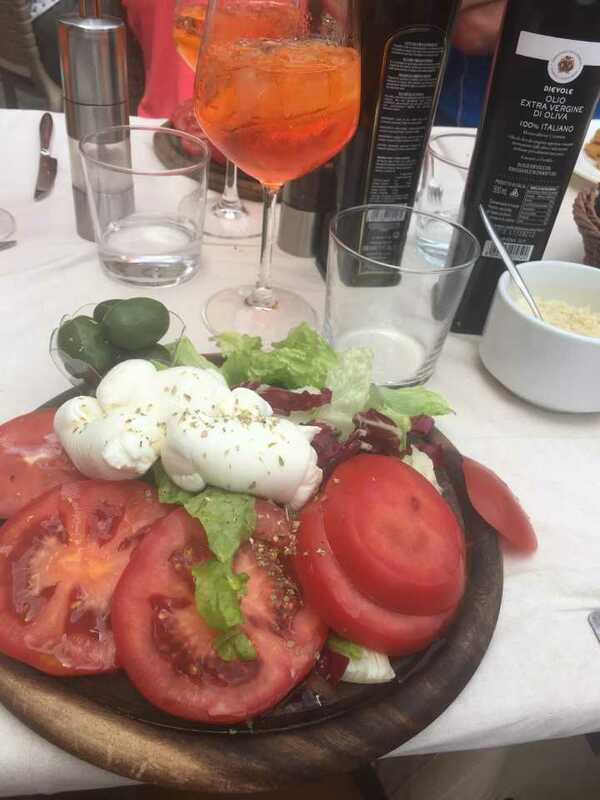 Travelling Italy as a teen with adults (parents, grandparents, or Aunts & Uncles) can sometimes prove to be difficult. 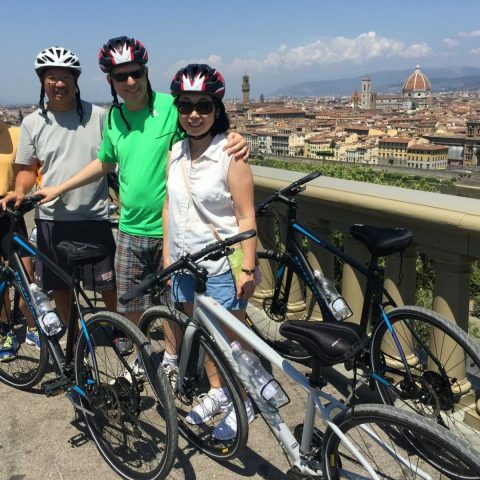 However, when I signed up on my own for a guided tour with Bike Florence&Tuscany, I knew I had found a promising activity which could potentially bridge the generations and dissolve a challenging situation. Maybe I should be a biker. Maybe I should move to Tuscany. I mean this view is just…WOW. 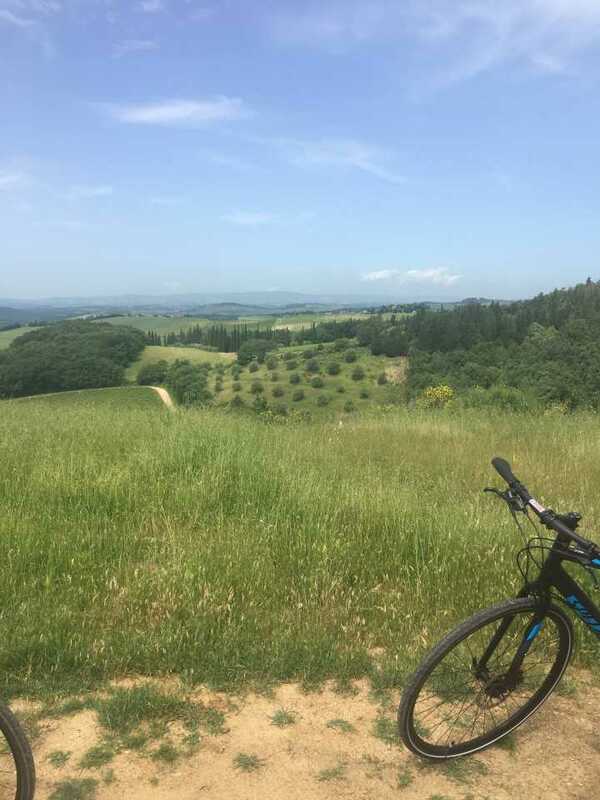 That’s what I thought as I rode my bike downhill through the lush green fields of Tuscany despite the fact that I wasn’t an avid biker at all. That’s what I thought as I rode my bike through Italy & fell in love with the scenery straight out of the movie “Under the Tuscan Sun”. Let me back up and tell you a bit about me first. I’m a 19 year-old college student from Florida, traveling Tuscany with my grandmother for the summer. I can straight out tell you, I’m not a huge fan of guided tours, I just feel super touristy doing them and I prefer the sensation of feeling like a local when I travel. Despite, that fact, I found myself signed up for a guided tour with Bike Florence and Tuscany. The idea was to do the tour together with my Grandmom since they have e-bikes for assisted peddling and a support van that would pick her up as soon as she was ready to relax. I found myself on the tour with two other teen girls roughly my age and their parents. None of us biked much, other than an occasional bike ride around the block for fun, and yet, here we were, ready to take on the hills of Tuscany during the refreshing morning hours. There’s something about biking through Tuscany along the roads less traveled, that had us falling in love with the landscape and atmosphere. One thing that normally deters me from guided tours, is the feeling that the tour guide is constantly watching you: it practically shouts TOURIST. However, with Elena, it wasn’t so much a guided tour but a travel companion. In fact, she was excellent, always keeping us informed about the trails we were following and the area around us as we biked. Yes. It was a tour. And yes. It was guided. It just didn’t feel like that, it felt like traveling with friends. Stopping at panoramic spots to rest, providing fascinating facts along the way, enjoying snacks and capturing the beautiful scenery. The van followed behind us, ensuring that we didn’t get left behind and providing assistance for those who felt they couldn’t keep going. While biking, we stopped at two medieval villages, providing wonderful photo opportunities and little boutique shops that we could go and visit. The stop at Lornano for the wine tasting was a highlight for everyone! The vineyard we stopped at surrounded a quaint 15th-century villa and the wine was excellent. We toured the wine cellar, learning about the process for producing wine before heading up to taste a wonderful selection of wine, including my favorite, Rosato Toscana “Etél”. This stop was certainly a favorite for our group: we were relaxed, we enjoyed wine samples and we had some laughs while joking around about our favorite wines. 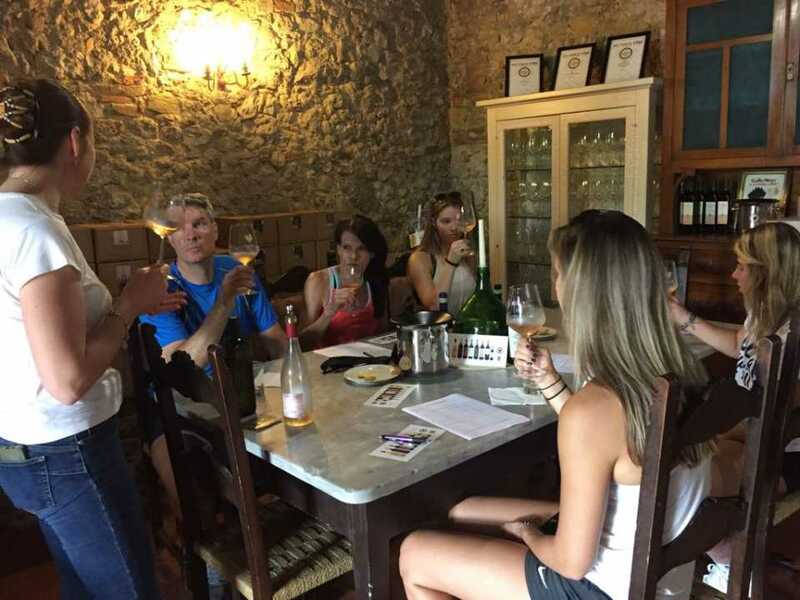 While the adults loved the in-depth wine experience, there was also an added thrill for the three of us girls because we could legally drink wine in Italy. When I first heard about the tour, it was difficult for me to decide whether it would be an enjoyable event for the entire family, or if it was mainly focused towards pleasing the adults and in that case, most teens would just feel dragged along (which can happen on vacation). Following the tour, I would say that both of the girls my age and I would agree that this is a terrific sightseeing opportunity for the entire family. 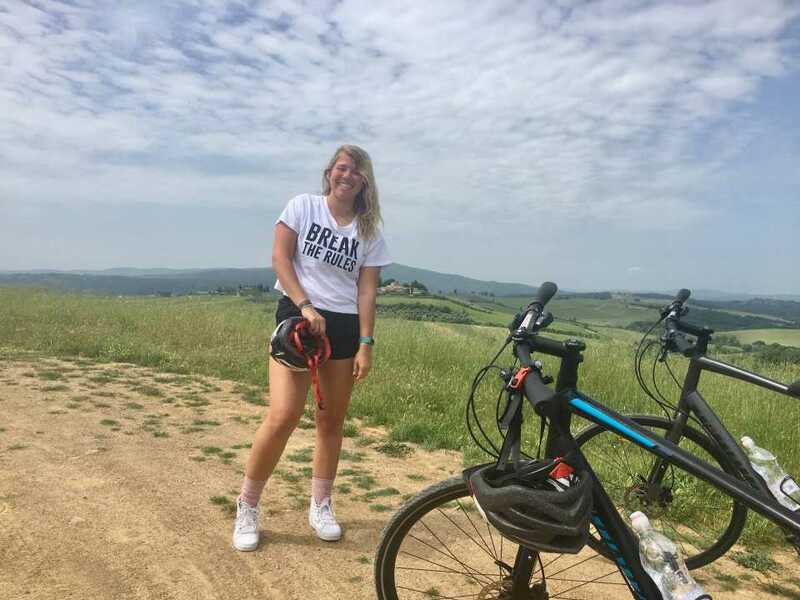 To sum it up, the tour combined experiences that everyone could relate to and under the watchful eye of Elena, we felt safe while sharing a hefty dose of laughter, photo opportunities and silliness to create lasting memories of biking through Tuscany. Our bike journey ended with a climb towards Siena. This last stretch really allowed us to appreciate the amazing quality of the bikes we were riding. With gears that shifted easily, allowing us to coast along and handlebars that provided comfort, we fell in love with these bikes and I admit, they made the trip a lot easier. I won’t lie, that last little stretch had us all slightly exhausted, but the promise of a van ride to Siena and lots of gelato kept us all pedaling uphill. 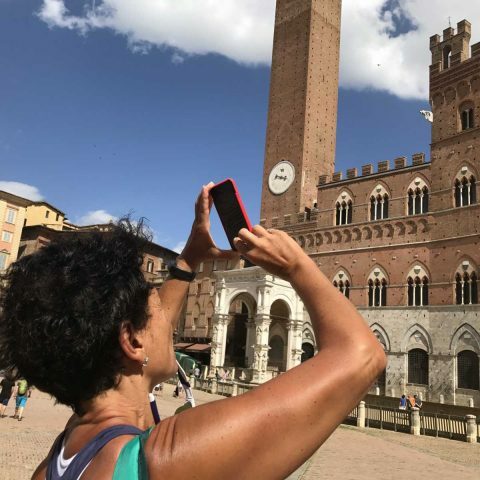 Upon arriving in Siena, Elena gave us detailed maps of the city, pointing out the towns highlights and a selection of enjoyable restaurants that she could attest to quality and price. 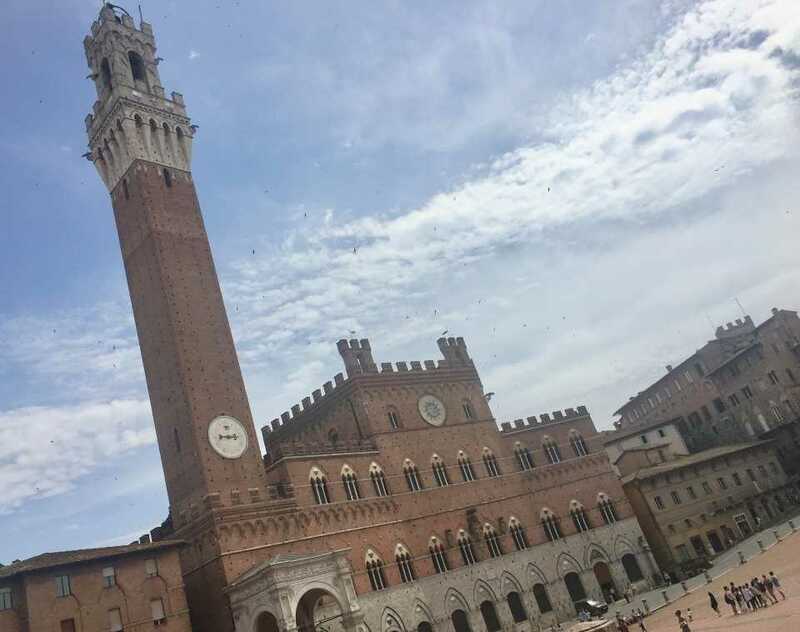 We had lunch at Trattoria Liberamente, a lovely restaurant in the town square of Siena while admiring the fountain, the Torre di Mangia and all the people taking photos. One of my other concerns with guided tours is that there won’t be enough time to see everything. However, on this tour, we found that we had plenty of time to wander the streets, peek into the shops, and eat as much gelato as we wished. All in all, taking the Bike Florence and Tuscany Crossing Chianti to Siena tour can be ranked as one of the highlights of my entire trip to Italy (thus far). 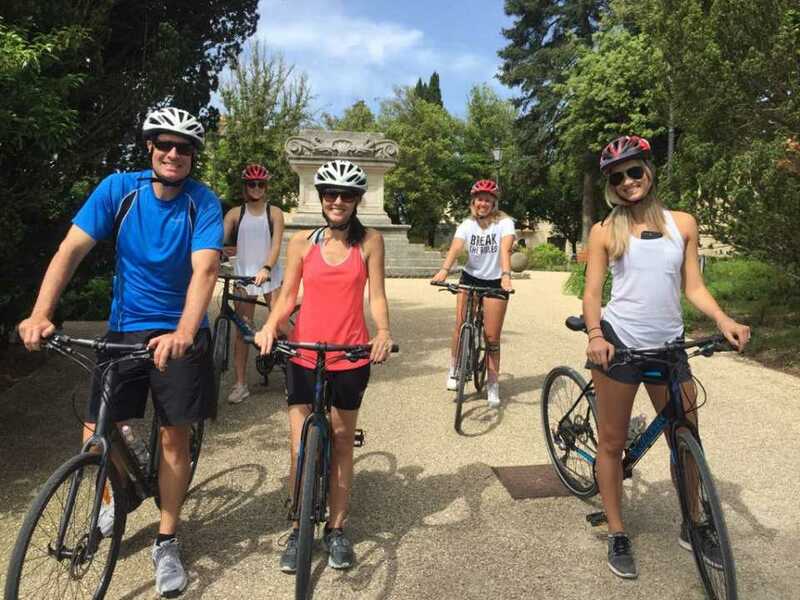 Despite the fact that everyone on our tour was a different age, and we all had different places we wished to see, each of us had a fantastic time and bonded during our biking adventures. 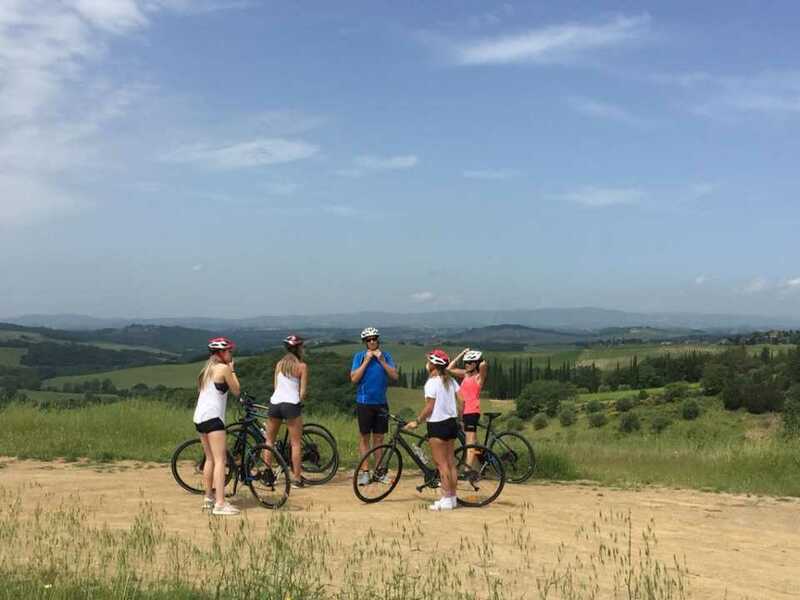 Between the breath-taking Tuscan scenery, the wine-tasting, the medieval villages, the laughter, and light-hearted teasing, this tour has wedged its way into my memories and I can attest that it is a great adventure for teens & young adults traveling with their parents.